We’d love your help. 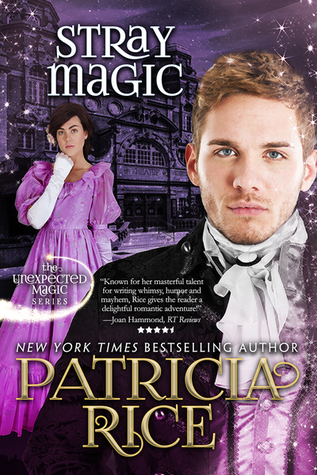 Let us know what’s wrong with this preview of Stray Magic by Patricia Rice. In creating two large, eccentric families, I will inevitably develop characters who never quite fit into a larger story. Jacques Bellamy-Ives is one of them. I adore Jacques. He's cheerful, he's highly intelligent, and he's creative-- always a plus in my book. He has his flaws, but none of them are large enough to justify 85,000 words to overcome. But even if he's not scientific like his brothers, Jacques does have one blind spot--he thinks Malcolm magic is just a lark. For those of you unfamiliar with my Unexpected Magic series--the Malcolms are a lively family of ladies with extra abilities. They don't generally read minds or the future, but they have unusual talents, like predicting events from the stars or healing with their hands or seeing ghosts. So you can understand why a practical, logical man would have difficulty grasping these totally improbably gifts--until he discovers a not-quite-normal ability of his own. To ask other readers questions about Stray Magic, please sign up. First of all, I love this series by Ms Rice. This is a novella with Jacques Bellamy-Ives who is a part of a family with every member blessed with a special talent. He is not scientific but he is a talented author of plays And he is in love with Seraphina the manager of the theater where he works. He is generous enough to provide a home for actresses who have no where to live. He is talented enough to have written what he believes will be a big success. But, a fire destroys his play and everything First of all, I love this series by Ms Rice. He is generous enough to provide a home for actresses who have no where to live. He is talented enough to have written what he believes will be a big success. But, a fire destroys his play and everything else. The theater company needs money. So, he convinces Seraphina to sing and charm people who will support the theater. Seraphina is the daughter of an actress. Her late father convinced her that life in the theater is not for her. And she has no idea that her love for Jacques could possibly be returned. The story is sweet. The characters are well developed even in a short format. The plot held my interest. I wanted the happily ever after that both Jacques and Seraphina deserve. I love this series. I have read all the Malcolm and St. ives books. Great characters, great plots, and love when we see characters we love show up in each subsequent book. my favorite and also least favorite point was Sersphina's father convincing her she was dumpy and that Jacque preferred men, so he could keep her close. Jacque had no idea why she didn't like him, while of course she was mad for him. Also, great opening scene. Hope there will be more. I love Rice's Magic series, this one is no exception, it is a short version of her stories, but I really enjoyed this about the theater people and how they got along. This story is a little different then the Magic stories with the male character having the different abilities in magic. Great story. A very fun short story about Jacques Bellamy-Ives, his life in the theater, and his love, Seraphina—the manager of the theater whose father told her Jack was gay so she wouldn’t fall in love with him. Circumstances lead to the introduction of Seraphina to the Ives and Malcolm families in a dinner gone awry. Very satisfying story. A cute story. I wish there was more to it. It does give you a taste of the series. Sweet romance with a bit of mystery. It is too short but it does fit with the series and provides satisfaction about Jacques life. I like this series. Full of magic, romance, saucy heroines and handsome heroes. And an HEA for all. Better if read as a series. Not as good as her original Magic series IMHO. A sweet short story. Playwright Jacques (Jack) Ives-Bellamy get his HEA with theatre owner Seraphina (Phin) Simmons. Thoroughly enjoyed.